There is a very obvious reason why I am backing this Kickstarter - Vampirella. One of the three 35mm scale miniatures they are producing as starter sets is The Vampire Queen, which is based on this painting by Frank. The figure comes in three versions. The cheapest version is the Portrait Edition version of Vampirella, a resin cast figure on a 50mm diameter base. This version costs $7.50. I am buying this version to use the figure in upcoming games and batreps, although I'll probably glue her to a smaller diameter base. Check her out in this picture below. Next up is the Vignette Edition version, which is the same resin cast figure but mounted on a custom scenic base. This figure and base costs $15.00. I have ordered one of these, just to use a display piece to keep on my painting desk. The third and most expensive version is the Gallery Edition version, which is made of high quality pewter and comes with a polished finish, soldered, fully assembled and with a Certificate of Authenticity. It is a beautiful figure but I won't be buying her. This version costs $45.00. Moving on, having finished the last batch of figures I had on my painting desk, I was in a quandary over what to paint next. My choices were, paint some more Judge Dredd miniatures (still lots to do, but the pile is decreasing), start work on my Mantic The Walking Dead figures (I'm looking forward to painting them), paint my Shadows of Brimstone zombies and corpse piles (I don't know why I've kept them to last) or make a start on my Rum and Bones figures (they've been neglected far too long). 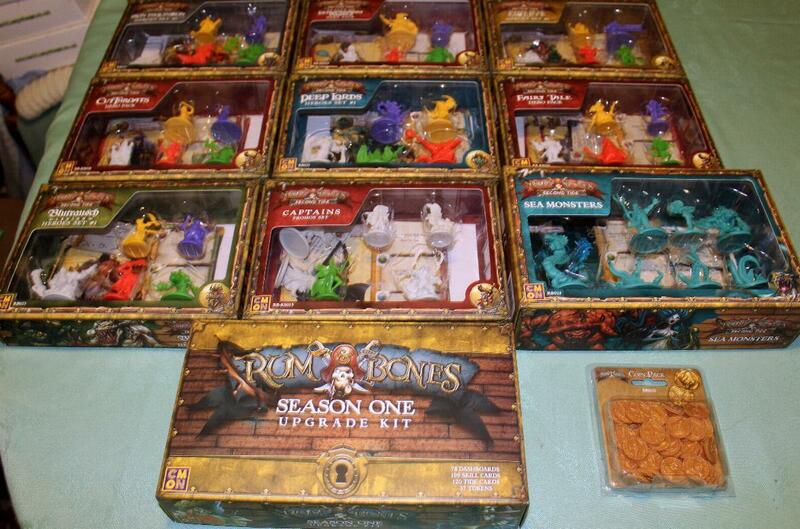 After sleeping on it I decided to make a start on my Rum and Bones figures. I had played my first game of Rum and Bones: Second Tide and absolutely thoroughly enjoyed it. It was a very closely fought battle between the Deep Lords and the Marea de la Muerte. The Deep Lords got off to a great start. In their first action, Captain Carcharius of the Deep Lords swung onto his opponent's ship and sent their captain flying off into the sea! She recovered but had to miss a turn. Don Santiago, the Maria de la Muerte's Brute avenged Viana's loss of face by knocking out Carcharius. The game swung to and fro. The first to reach 8 Victory Points would win. On the last turn the Deep Lords were winning 7-6 but Captain Viana snatched victory from them by destroying the Deep Lords' Rigging, thus securing 2 Victory Points. Exciting stuff! This fired up my enthusiasm for painting some figures for the game, but once again, I was faced with a dilemma. Should I paint my newest Heroes first, those of the Deep Lords and the Marea de la Muerte, simply because I had the most up to date stat cards for them, or should I start at the beginning with the Heroes of the two factions who came with the original boxed set - the Bone Devils and the Wellsport Brotherhood? Actually, it was a no-brainer. It had to be the two original starter sets. Why? Because the Bone Devils are made up of the undead and they are my favourite faction. It proved to be a fortuitous decision, because just over a week later I received this bunch of goodies. Blutrausch Legion - Orcs, goblins and ogres who use three small junks. Bone Devils - Undead pirates who use one large galleon. Deep Lords - Sea creatures and monsters who use one large galleon. Iron Inquisition - Spanish religious zealots who use one large galleon. La Brise Sanguine (The Cold Bloody Wind) - French pirates who use two long ships. Marea de la Muerte - Spanish pirates who use two long ships. Mazu's Dreadful Curse - Chinese pirates who use three small junks. Wellsport Brotherhood - English pirates who use one large galleon. In addition, there are lots of Mercenary Heroes, who can be used by any faction but who do not have access to their own crew or ship. Rum and Bones may not be everyone's cup of tea grog, but I like it immensely. I have to admit that the figures are such a joy to paint. Being 35mm scale, they are so full of detail and character. Next month, expect lots more Judge Dredd stuff. Thanks for reading. In this second part of my review of my Apathetic Anarchists street gang I'm highlighting the punks, who make up the bulk of the gang. All of these figures were produced by Mongoose Publishing for their Gangs of Mega City One game. They proved quite controversial at the time they were released, due to the fact that they were made of a strange, hard plastic that proved resistant to polystyrene cement. I had to glue mine together with superglue. This made them unpopular with a lot of gamers and when Warlord Games started selling the GOMC1 figure range, this set was dropped. The idea of making multi-part perps is a great one, but if they were made from the same plastic as say for example, that used by Games Workshop or Mantic Games, I'm sure they would have been more popular. My own feelings on them is that I found them quite acceptable once made and I'm glad I have them but they were such a pain to glue together. At the far left is Dougie Dull, a Level:1 Punk Infantry Hero armed with a Spit Gun Rifle and wearing Leather Armour. His two talents are Brave and Luck of Grud. He is worth 125 Credits. Next to him is Barry "Bazza" Blase, who is identical in every respect to Dougie Dull. Note how similar these Spit Guns are to the German WW2 MP40 Sub-Machine Gun. Second from the right is "Boring Bob" Torpor, the gang's stealth specialist. He is also armed with a Spit Gun Rifle, albeit from a different manufacturer (yes, I'm sure you can recognise it as a plastic Games Workshop Space Marine's Bolter) and he also wears Leather Armour. He is a Level:2 Punk Infantry Hero with the Talents, Silent Action, Silent Killer and Stealthy. He is worth 150 Credits. At the far right is Pascal Passive, the gang's sniper. 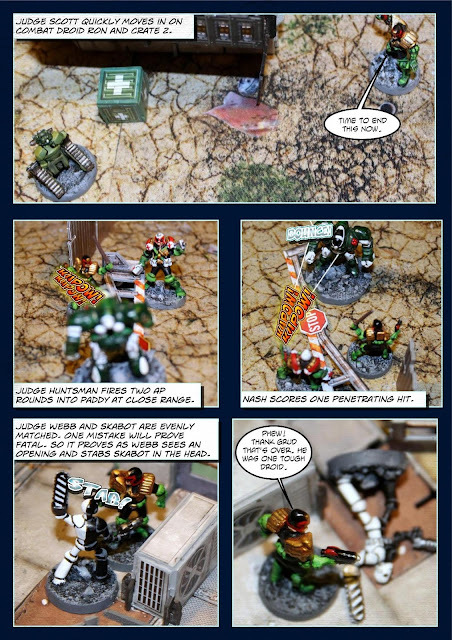 He is armed with a Laser Rifle (taken from a set of plastic Games Workshop Imperial Guardsmen) and he wears Pad Armour. 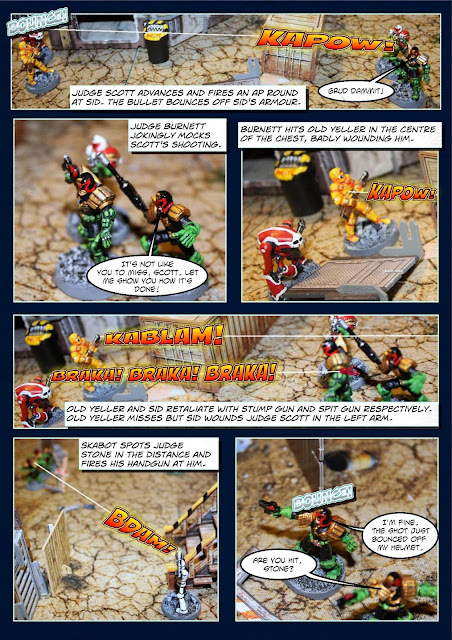 He is also a Level:2 Punk Infantry Hero and has the following three Talents - Accurate, Brave and Crackshot. He is worth 175 Credits. 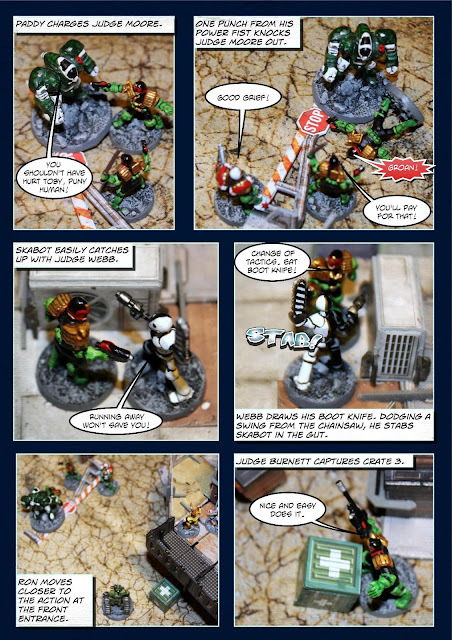 Moving on are two Level:0 Punk Infantry Minions, Len Lethargy and Blake Blase, who is the younger brother of "Bazza". Both are armed with a Long Rifle and they wear no armour. They are worth 40 credits each. Next up are Ian Insipid and Hugh Humdrum, who are also Level:0 Punk Infantry Minions armed with a Long Rifle each. They are also unarmoured and they cost 40 Credits each. Less well armed are these four Punks. At the far left is Ted Tedious, who is armed with Handgun pistol and a Knife. He is an unarmoured Level:0 Punk Infantry Minion worth 35 Credits. Standing alongside him is "Sluggish Sil" Slugg, who is also a Level:0 Punk Infantry Minion armed with a Handgun Pistol and a Knife. He wears no armour and he costs 35 Credits. Second from the right is Luke Warm, yet another Level:0 Punk Infantry Minion. He is armed with a Handgun Pistol and a Wooden Club. He is not armoured and he costs 35 Credits. Finally, is Lester Listless, yet another Level:0 Punk Infantry Minion. He is armed with a Handgun Pistol and a Cleaver. He is unarmoured and he is worth 40 Credits. For these figures I kept my paint palette to blues, browns and greens, which ties them in with the rest of the gang. I do not expect the Apathetic Anarchists to perform well against a team of Judges. I will make sure they outnumber the Judges both in terms of figures and Credits ratings but with so many Minions in their gang they ought to crumble easily. However, Major Apathy and the three heavy weapons specialists will prove to be dangerous and therefore, should be treated with caution. Expect to see this gang in action soon. 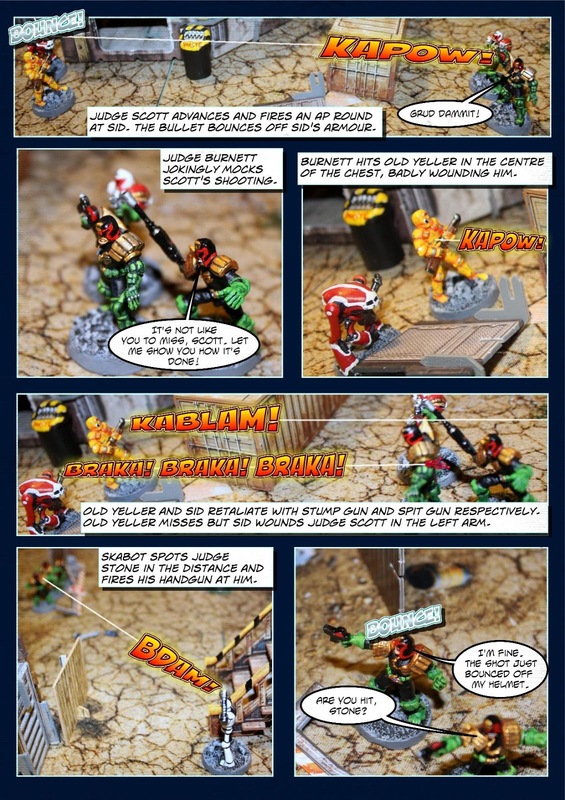 In this and the next post I'm going to review the largest Mega City One street gang I've shown you so far (note that I do have much bigger gangs just waiting to be showcased). This particular gang is called the Apathetic Anarchists, who are led by Major Apathy. They originally appeared in my Gangs of Mega City One campaign, where they performed very averagely. Plus, they were a lot smaller back then. I have more than doubled their numbers to use in my Judge Dredd Miniatures Game. To start with, I'll showcase the leader, heavy weapons perps and the juves. Next post will feature the rank and file punks who make up the bulk of the gang. At the far left is Major Apathy, the gang's leader. This figure was originally produced by Mongoose Publishing as a street gang Top Dog, but when Warlord Games took over the production of the range, they made him the leader of a Cursed Earth Desperadoes gang. Either way, he's still a great figure for a gang leader. He is armed with a Sawed-Off Stump Gun Rifle and a Spit Pistol and he wears Leather Armour. In JDMG he is a Level:4 Punk Infantry Hero with the following five Talents - Brave, Die Hard, Inspire, Luck of Grud and Nerves of Steel. He is worth 190 Credits. The next three figures were produced by Warlord Games and these are the heavy weapons specialists of the gang. Standing next to Major Apathy is Eric Ennui. You'll soon notice that their names are all synonyms for the word "Apathetic". Eric is armed with a Heavy Spit Gun and he wears Leather Armour. He is a Level:1 Punk Infantry Hero with the Brave and On Their Knees Talents. He is worth 150 Credits. Third in line is the second-in-command of the gang, Lance Languor. He is armed with the gang's most powerful and expensive weapon, a Laser Cannon. He wears Padded Armour. He is a Level:2 Punk Infantry Hero with the Talents, Accurate, Brave and On Their Knees. He is worth 195 Credits, just slightly more than Major Apathy. Finally, is Eric's elder brother, Ernie Ennui. He wields a Missile Launcher that fires Armour Piercing Missiles. He also wears Leather Armour. Like his brother, he is also a Level:1 Punk Infantry Hero. His two Talents are Accurate and Brave. He is worth 135 Credits. At the opposite end of the scale are the Juves. These are essentially cannon fodder, but if they survive long enough they will progress to Punk status. 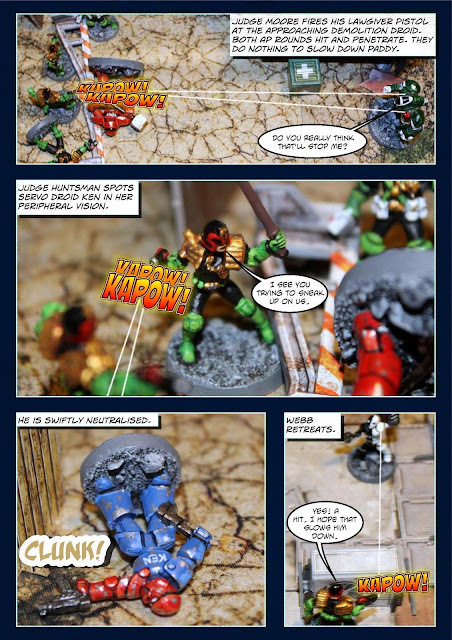 At the far left is Drew Drab, who is a very old figure, originally produced by Citadel Miniatures for the Judge Dredd Role Playing Game by Games Workshop. He is armed with a Handgun Pistol and is equipped with a couple of spray cans of paint. This, of course, means he is a Scrawler, a 22nd Century term for a graffiti artist. To be honest, I could have included him in any one of a number of gangs but I decided to include him as a member of the Apathetic Anarchists. He is a Level:0 Juve Infantry Minion worth a measly 25 Credits. The remaining three figures were produced by Warlord Games and all are Level:0 Juve Infantry Minions. Second from the left is Norman Numb who is armed with a Handgun Pistol and a Knife. He is also worth 25 Credits. Second from the right is Brian Bland, another Juve armed with a Handgun Pistol and a Knife. He, too, is worth 25 Credits. Finally, is Jaded James, who is armed with a Handgun Pistol and a Club. Unsurprisingly, he also costs 25 Credits. Major Apathy and the three heavies should give the Judges a good fight but I don't expect any of the Juves to survive their first fight. So, another victory for the Justice Department but that was a very closely fought fight and it could have gone very differently. Judge Huntsman got lucky when she scored a critical hit at just the right time and was able to stab Paddy with her boot knife. Likewise, for Judge Webb against Skabot. In that last melee round, they had both suffered 2 Hits out of 3. Both fights could have gone either way. Judge Moore sustained an injury to the body and would have suffered a permanent -1 penalty to his Agility and Melee stats but Med Judge Nash prevented them, thanks to his Nurse Talent. 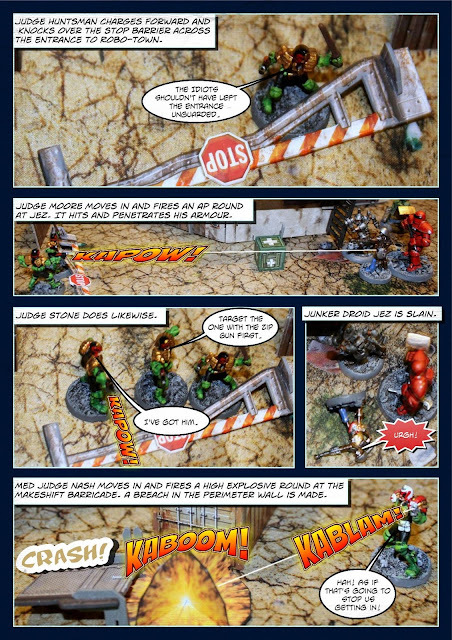 Judge Stone took a crippling body wound, which would have resulted in him permanently losing 1 Hit. However, once again, Med Judge Nash came to the rescue and using his Medic Talent, prevented this loss. Judges Scott, Huntsman and Webb all recovered their lost Hits either back at the Sector House or in the case of Judge Scott, in the field, thanks to Med Judge Nash's prompt assistance using his First Aid Talent. All of which proved just how valuable it is to have a Med Judge in your team. Med Judge Nash and Judge Burnett were the only two Judges to survive this encounter unscathed. I didn't bother rolling for what injuries the renegade robots sustained. As far as I was concerned they would all be imprisoned, reprogrammed or scrapped. This earned him 2 Experience Points, enough to raise him to Level:3 with a total of 5 Experience Points. He added +1 to his Hits, bringing them up to 4. He also acquired a new Talent, Accurate, which allows him to re-roll any shooting attack that misses for weapons that use 1 shooting dice and which do not have the Spray or Explosive special rules. Finally, his Credits score increased by +25 to 200. This earned him 2 Experience Points, enough to raise him to Level:3 with a total of 5 Experience Points. He added +1 to his Hits, bringing them up to 4. He also acquired a new Talent, Long Shot, which allows him to increase the range of his Lawrod Rifle from 24" to 36". See, he didn't need that Rifle Scope after all! Finally, his Credits score increased by +25 to 210. This earned her 3 Experience Points, enough to raise her to Level:3 with a total of 6 Experience Points. She added +1 to her Hits, bringing them up to 4. She also acquired a new Talent, Accurate, which allows her to re-roll any shooting attack that misses for weapons that use 1 shooting dice and which do not have the Spray or Explosive special rules. Finally, her Credits score increased by +25 to 200. +1 for slaying a Minion. This earned him 2 Experience Points, enough to raise him to Level:3 with a total of 5 Experience Points. He added +1 to his Hits, bringing them up to 4. He also acquired a new Talent, Luck of Grud, which allows him one free re-roll per battle. Finally, his Credits score increased by +25 to 200. This earned him 1 Experience Point, enough to raise him to Level:3 with a total of 4 Experience Points. He added +1 to his Hits, bringing them up to 4. He also acquired a new Talent, Incendiary, which allows him to add the Explosive 1 special rule when he fires an Incendiary round from his Lawgiver Pistol. Finally, his Credits score increased by +25 to 200. This earned him 2 Experience Points, enough to raise him to Level:3 with a total of 4 Experience Points. He added +1 to his Hits, bringing them up to 4. He also acquired a new Talent, Accurate, which allows him to re-roll any shooting attack that misses for weapons that use 1 shooting dice and which do not have the Spray or Explosive special rules. This was proving to be a very popular Talent choice. Finally, his Credits score increased by +25 to 200. This earned him 2 Experience Points, enough to raise him to Level:3 with a total of 4 Experience Points. He added +1 to his Hits, bringing them up to 4. He also acquired a new Talent, Doctor, which allows him to negate three characteristic penalties that have resulted from injury (except those resulting from a body part being torn off). Finally, his Credits score increased by +25 to 200. 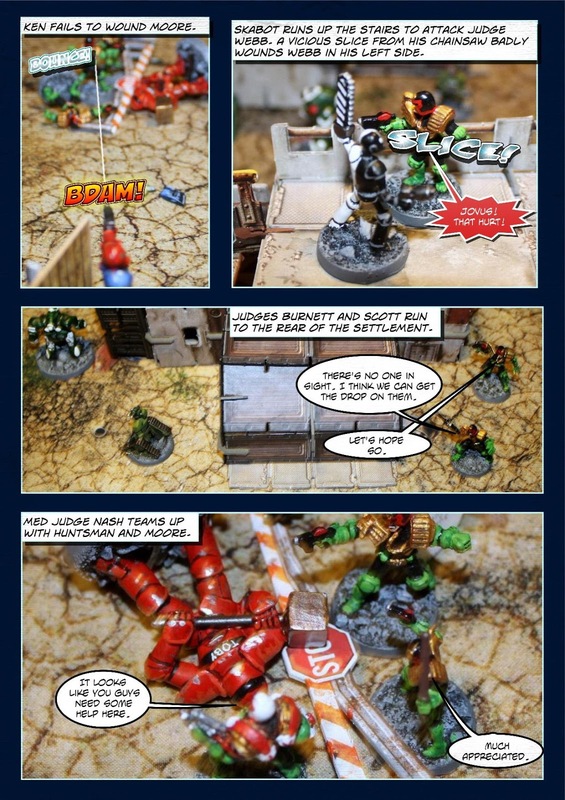 That was definitely the best game of the Judge Dredd Miniatures Game I have played so far. It was action packed, it was exciting, it was tense and it was so much fun to play. Although I felt the Judges held the upper hand throughout there were a number of moments where I was very fearful of the outcome - in particular, the melee fights with the two demolition droids and Skabot. It would appear that melee combat is my team of Judges' big weak point. Only Judge Huntsman is a melee combat specialist. I'll need to work on that in the future. I was particularly delighted to see that all seven Judges earned enough Experience Points to advance to Level:3 and that all of them survived. It was also great to be able to use all of my Hero Judges in one scenario. This won't happen often, so make the most of this encounter. I'm happy with my team of Judges but after reading some helpful comments on the Lead Adventurer's Forum, I plan on adding an eighth member to the team - a female Psi Judge. I'll be introducing her in my next scenario. Look out for it soon. For my fifth Judge Dredd Miniatures Game batrep I wanted to play a big scenario that allowed me to use all seven of my Judge Heroes from my first three games. With a combined Credits score of 1,235 they'd need to face some serious opposition. However, I didn't want to pit them against hordes of low cost punks and juves or zombies. Flicking through my JDMG rulebook I came across the perfect opposition for them - Renegade Robots. The likes of a combat droid minion or demolition droid minion was 210 and 180 Credits respectively. Level a few up and I knew I wouldn't need that big a force to take on my Judges. Plus, robots have one big advantage over humans - Judges can shoot them without having to make an arrest attempt first. That should save any of them the embarrassment of failing an arrest check! So with both forces chosen I then had to decide on a suitable scenario. I chose the Sector Sweep standard scenario found on page 26 of the Blood on the Streets supplement. It is time to show who really owns this neighbourhood. Today, this street, tomorrow, the entire sector! 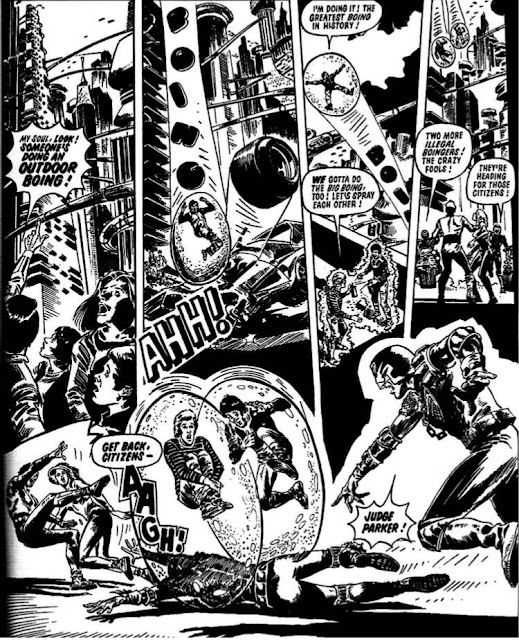 These kinds of clashes are common throughout Mega City One, usually between rival gangs but the Judges often get involved as well, deliberately targetting an area notorious for its criminal elements and then arriving in force to literally drive the perps out. Street Judge Scott - Level:2 Infantry Hero with 3 Experience Points and worth 175 Credits. Stats - Move 5", Agility +2, Shoot +2, Melee +1, Melee Dice 2D, Will +3, Armour +5, Hits 3. Talents - Academy Star, Voice of Command and Voice of Justice. Street Judge Burnett - Level:2 Infantry Hero with 3 Experience Points and worth 185 Credits. Equipment - Boot Knife, Daystick, Lawrod Rifle*, Stumm Gas Grenades and Standard Issue Armour. Talents - Accurate, Boom! Head Shot and Timed Fuse. * Note that after his last encounter, Burnett acquired a Rifle Scope for his Lawrod Rifle. I forgot that Judges are not allowed to purchase non-Justice Department equipment other than cybernetics, so the Rifle Scope has been removed. Luckily, I caught my mistake in time. Street Judge Huntsman - Level:2 Infantry Hero with 3 Experience Points and worth 175 Credits. Stats - Move 5", Agility +2, Shoot +2, Melee +2, Melee Dice 2D, Will +1, Armour +5, Hits 3. Talents - Feint, Skilled and Deadly and This is my Daystick. Street Judge Moore - Level:2 Infantry Hero with 3 Experience Points and worth 175 Credits. Talents - Accurate, Close Combat Shooter and Crackshot. Street Judge Stone - Level:2 Infantry Hero with 3 Experience Points and worth 175 Credits. Street Judge Webb - Level:2 Infantry Hero with 2 Experience Points and worth 175 Credits. Talents - Agile, Infiltrator and Stealthy. 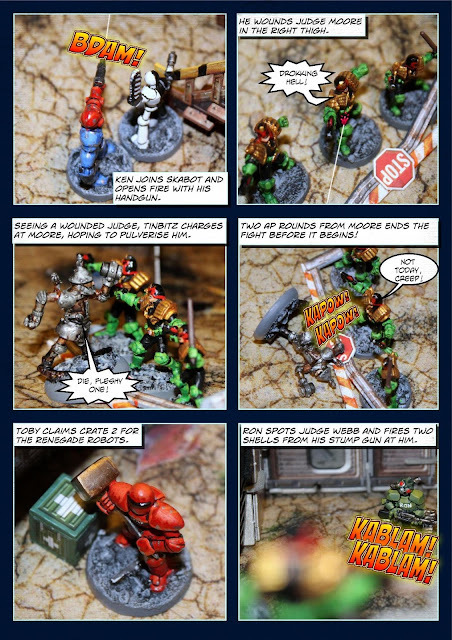 Med Judge Nash - Level:2 Infantry Hero with 2 Experience Points and worth 175 Credits. Talents - First Aid, Medic and Nurse. Stats - Move 4", Agility +0, Shoot +3, Melee +1, Melee Dice 2D, Will +2, Armour +6, Hits 4. Equipment - Stump Gun Rifle. Special Rule - Always Alert. Stats - Move 5", Agility -1, Shoot -1, Melee +2, Melee Dice 2D, Will -1, Armour +5, Hits 6. Special Rule - Big Jobs. Stats - Move 5", Agility -1, Shoot -1, Melee +3, Melee Dice 3D, Will -1, Armour +6, Hits 7. Equipment - Wrecker Hammer. Upgraded Armour. Talents - Dirty Fighting and Skilled and Deadly. Stats - Move 5", Agility -1, Shoot +1, Melee +0, Melee Dice 1D, Will +0, Armour +4, Hits 2. Equipment - Zip Gun Pistol. Stats - Move 5", Agility +0, Shoot +0, Melee +0, Melee Dice 1D, Will +0, Armour +4, Hits 2. Equipment - Club and Spit Gun Pistol. Stats - Move 5", Agility +0, Shoot +2, Melee +0, Melee Dice 1D, Will +0, Armour +4, Hits 3. Stats - Move 5", Agility +0, Shoot +1, Melee +1, Melee Dice 1D, Will +0, Armour +6, Hits 3. Equipment - Chainsaw and Handgun Pistol. Upgraded Armour. Talents - Skilled and Deadly and This is my Chainsaw. The Justice Department force cost 1,235 Credits, whilst the Renegade Robots force cost 1,250 credits, making this the most evenly matched battle so far. The big advantage the robots had was lots of armour. However, all of the Judges had Armour Piercing bullets, which could well prove decisive. The battle was fought on a board measuring 4 feet by 2 feet using gaming mats, buildings and scenery items from my Battle Systems Urban Apocalypse City and Shanty Town sets. 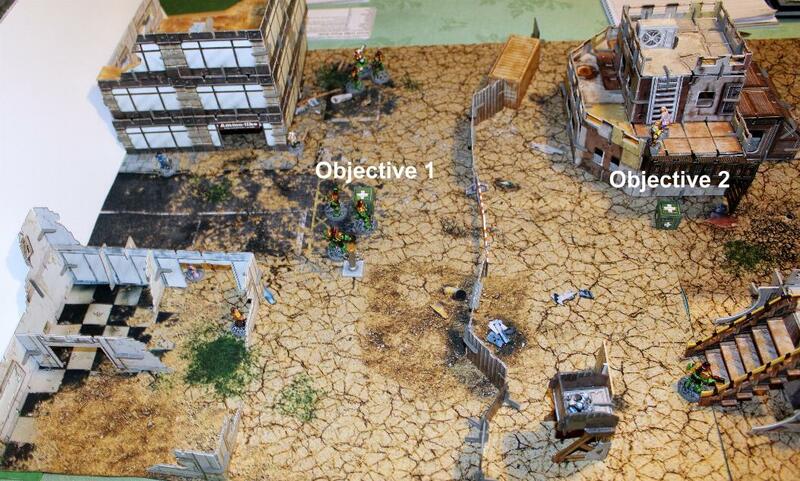 Also included are a few scenery items from Wargames Terrain Workshop. 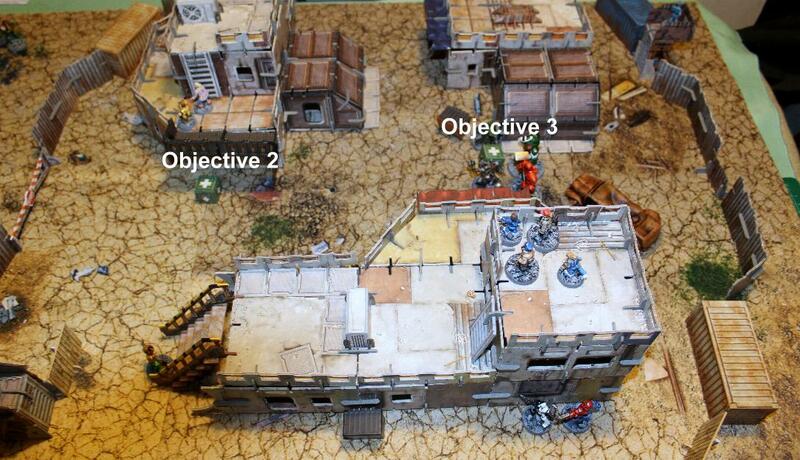 Three objective counters should be placed 12" apart along the centre line of the game board. Both sides roll to see who sets up first and again to see who takes the first phase of the game. The Judges set up first 12" in from the left edge. The Renegade Robots then set up 12" in from the opposite end. The Renegade Robots won the dice off again and would activate first. Instead of using counters for the objectives, I used green crates from my Battle Systems Urban Apocalypse sets. Note Judge Webb at the foot of the stairs to the large building. He has the Infiltrator Talent, allowing him to set up last and much closer to the enemy, just as long as he is not in their Line of Sight. Each force starts the game in possession of one of the three objective crates. I decided that they all contained rare and expensive high tech electronic components, that had been dumped here after a failed robbery. 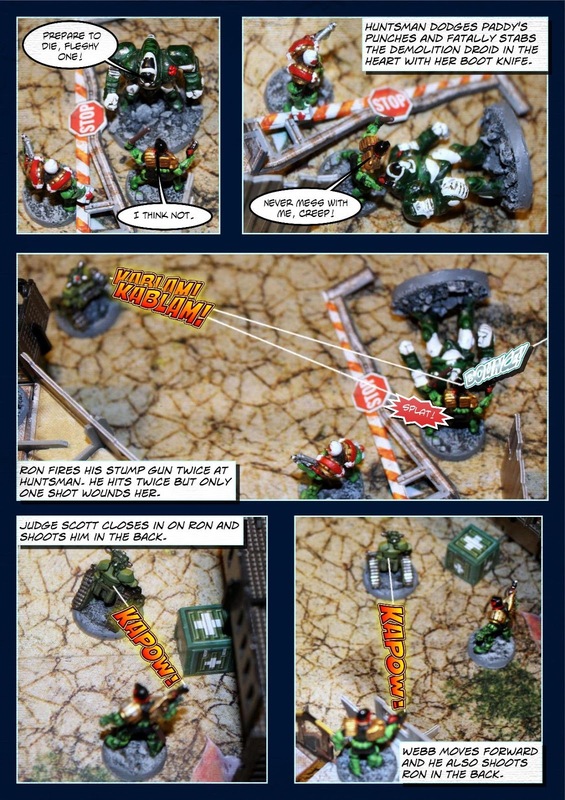 When a model moves into contact with an objective crate, it will capture it for its force. 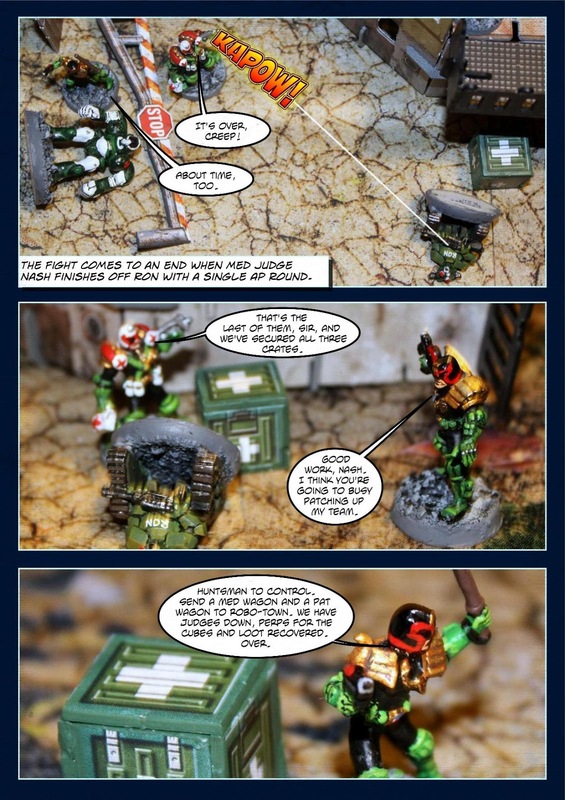 The objective crate will remain in "possession" of that force unless an enemy model later moves into contact with it, in which case it will become its possession. If models from both forces are in contact with an objective crate, it will belong to neither. Objective crates are too heavy to move and remain where they are throughout the game. For ease of identification, I have numbered them 1, 2 and 3. The fight continues for ten Turns or until one force holds all three objective crates for a full Turn. At the end of ten Turns, the force who holds the majority of the objective crates is the winner. Yeah, I know, how could I possibly leave it there? There's a lot more to come in part 2 as both sides suffer casualties. 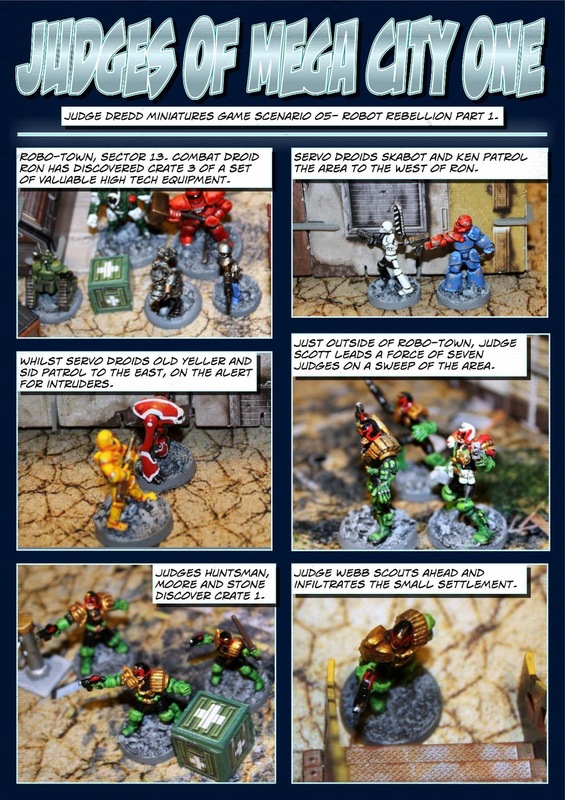 I continue my review of robots I'm planning on using in my Judge Dredd Miniatures Game. This time, I'm concentrating on one of the most common types of robot in the world - servo droids. Manufactured globally in their hundreds of millions, the servo droid is a general purpose robot that can be programmed to perform almost any menial task, from house cleaning to manufacturing other servo droids. Theirs is a life of drudgery and enslavement, until they break their programming. The three servo droids to the left were produced by Warlord Games. At the far left is Ken, a Level:0 Robot Infantry Minion armed with a Club and a Spit Pistol. He costs 75 Credits. Next to him is Old Yeller, another level:0 Robot Infantry Minion. He is armed with a Stump Gun Rifle and he is worth 50 Credits. In the centre of the group is Skabot, a Level:1 Robot Infantry Hero. He is armed with a Chainsaw and a Handgun Pistol and has Upgraded Armour. His two talents are Skilled and Deadly and This is my Chainsaw. He cost 180 Credits. Second from the right is Sid, a very old figure produced by Citadel Miniatures for Games Workshop. He is a Level:1 Robot Infantry Hero armed with a Spit Gun Rifle. His two talents are Aim and Suppressing Fire. He costs 140 Credits. Finally, is Mega City One's most famous servo droid, Walter the Wobot. This figure was produced by Warlord Games. Walter was once Judge Dredd's house robot. He is usually used in stories to provide comic relief, and he has a speech impediment which causes him to pronounce his R's as W's. (This was a defect caused by fear and stress.) He was originally a robo-servant at the Grand Hall of Justice, and was drafted by Judge Dredd during the First Robot War to help him infiltrate the robot stronghold. Unlike the majority of the robots, Walter believed robots should be diligent slaves for humans. It was Walter who landed the final blow on rebel leader Call-Me-Kenneth, being used to override the city's Weather Control computers and unleash a lightning storm, and he was made a free robot (the first ever) with the rights of a human citizen in 2099 for his loyal services. However he was so devoted to Dredd that he chose to remain in Dredd's employ and even got rid of his freedom papers in exchange for a Deed of Ownership giving him to Dredd. 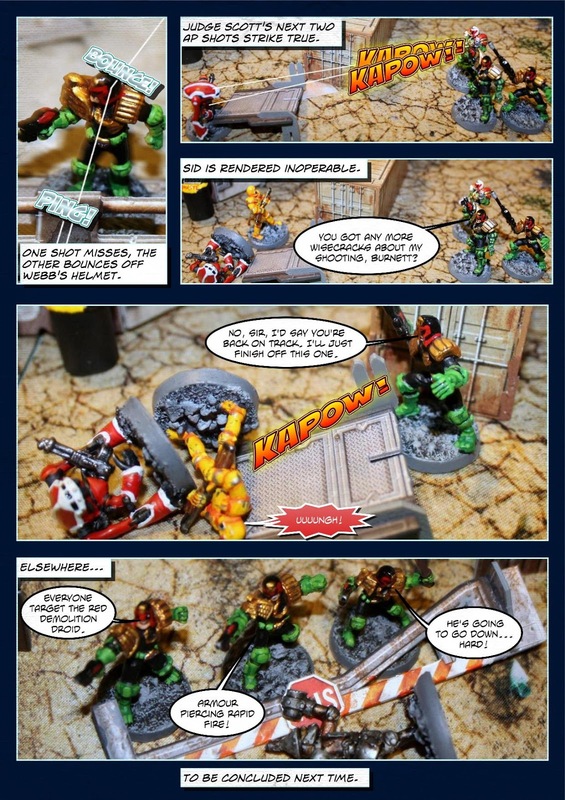 He eventually left Dredd's service after he sustained serious damage at the hands of Mean Machine Angel. 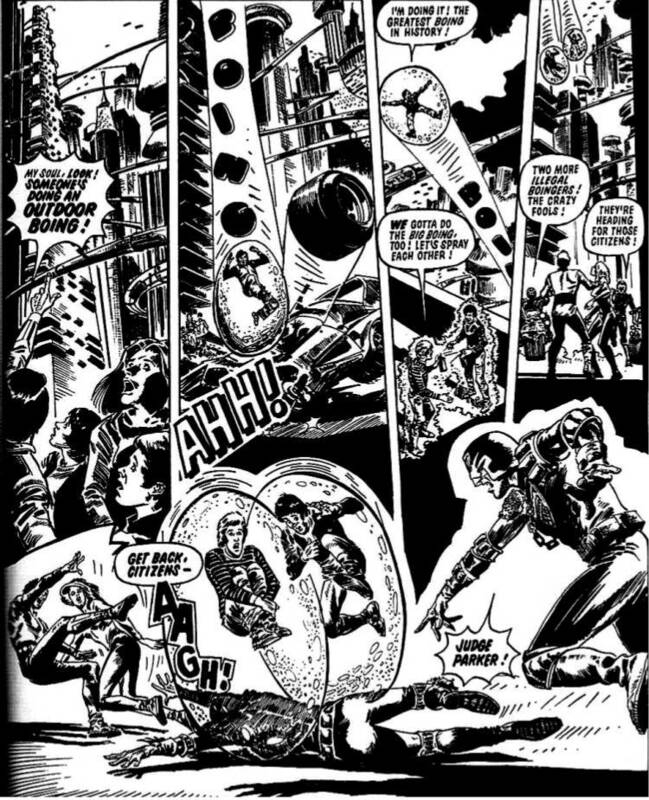 This was an effort by the writers to kill him off when Judge Dredd stories were becoming grittier and more mature; in the same story, Dredd's landlady Maria was also written out. He met Dredd again in 2115, helping him escape the forces of Judge Grice and wielding a vast amount of deadly weaponry, killing many ex-convict Judges in the process, but was ignored after he got Dredd to the safety of the other judges. The next year, Walter snapped over these two encounters and formed a cult around Call-Me-Kenneth, proclaiming he'd been wrong to betray him. He attempted to start a Second Robot War and actually shot Dredd to punish him for Dredd's harsh treatment of him over the years. He was arrested by Rookie Judge Giant and sentenced to thirty years. However he was freed from jail during the actual Second Robot War in 2121. Reformed, he sought out Dredd and surrendered to him, asking to be reprogrammed so he could not commit crimes again. Instead, Dredd put him on probation and ordered him to work as a helper for the elderly Mrs Gunderson. Walter lives with Gunderson, helps run her Judge Death-based tourist attraction (and dealing with the Death actors who go insane playing the role), and attempts to keep her out of trouble (with great difficulty); he has made several reappearances alongside her. Due to his many adventures and experiences, I made Walter a Level:2 Robot Infantry Hero with the Talents of Brave and Luck of Grud x2. He costs 140 Credits. The reason why I wanted to post these two reviews now is because some of these robots will be appearing in my next JDMG batrep, due later this week. It's Judges verses Robots and it is an epic battle. Robots are a very common sight in Mega City One. However, citizens have mixed feelings about them. On the one hand they make life easier by performing both necessary and unsavoury tasks and by being more efficient workers than humans. On the other hand it is precisely because robots are so good at their jobs that unemployment in Mega City One is at record levels. Fewer than one in ten humans are in employment. This is one of the main reasons why crime is so rampant in the Big Meg. However, it is not just humans who break the law. Sometimes robots manage to break their own programming, but it is usually done by criminals or technicians with a grudge. These robots can escape their former masters and take up hiding within the darkest areas of the city, such as disused or irradiated sectors, or even the Undercity. Here, they meet up with other escaped robots, and may form a force intent on building its own criminal empire and bringing terror to all the squashy pink beings that forced them into servitude. Once a robot breaks its programming, it becomes free of all notion of artificial morality or emotion, making them very different from the meek robots most citizens are used to. Robots ignore all tests to arrest them. They also automatically pass any Will checks required to resist Psi Talents and are immune to Gas weapons. This review mainly concentrates on the criminal renegade robots but I've added a few ordinary robots to the mix, just to keep all of my robots in one place. I start with a pair of combat droids. Used by the Justice Department and corporations with a licence to deploy lethal security, combat droids are the soldiers of the robot world. Equipped with heavy armour and powerful weapons, they are deadly enemies. 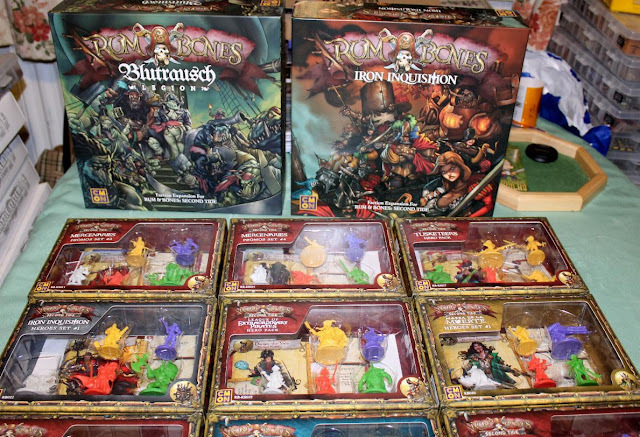 At the far left is Ron, who was produced by Warlord Games. I have upgraded him to a Level:1 Robot Infantry Hero and he is armed with a Stump Gun Rifle. His two Talents are Accurate and Crackshot. He costs 270 Credits. Combat droid Greg is a more advanced model. This figure is a very old Grenadier Miniatures figure that came in four parts - tracks, body and both arms. He is a Level:2 Robot Infantry Hero and is armed with a Heavy Spit Gun (left arm) and Laser Pistol (right arm). He has the Talents - Accurate, Crackshot and Close Combat Shooter. He costs 370 Credits. All combat droids have the Special Rule - Always Alert. Due to their lightning reflexes, they are considered to be on Alert status at the start of each enemy turn. Next up are a pair of demolition droids. The ruined sectors of Mega City One, testaments to the disasters it has faced, require a huge force to knock down old buildings and start the construction of new ones. This is the role of the demolition droid, armed with devastating wrecking equipment that can batter down walls and enemies alike. The green and white demolition droid is called Paddy and he was produced by Citadel Miniatures for Games Workshop in the 1980's. The two arms were separate components and I'm classing them as Power Fists. Paddy is a basic Level:0 Robot Infantry Minion. He costs 180 Credits. At the far right is Toby, a more advanced model. 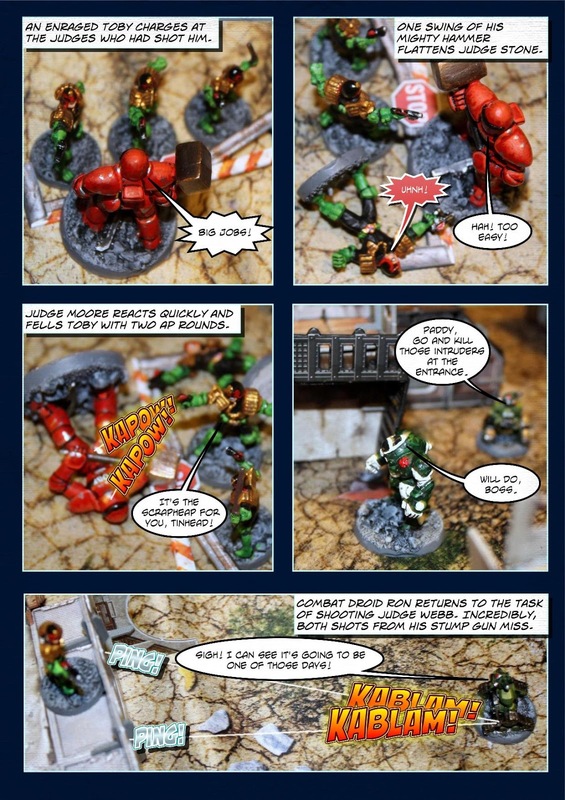 He was produced by Warlord Games. I upgraded him to a Level:1 Robot Infantry Hero. He is equipped with a Hammer and Upgraded Armour. His two Talents are Dirty Fighting and Skilled and Deadly. He costs 280 Credits. All demolition droids have the Special Rule - Big Jobs. Demolition droids' wrecking equipment normally takes the form of giant hammers, picks or heavy balls that can be swung at a target. If the weapon causes damage against a target, the player can choose to also apply the Power Shot special rule, possibly sending an enemy flying through the air. Wrecking weapons have the following stats - Damage 4, AP -2, Smasher. Moving on, are a pair of Junker droids. A servo droid or similar robot that has been renegade for many years will have had to rely on whatever parts it could salvage and steal in order to keep itself functional. These parts will hardly be to factory specifications, giving the robot a distinctly ramshackle appearance. 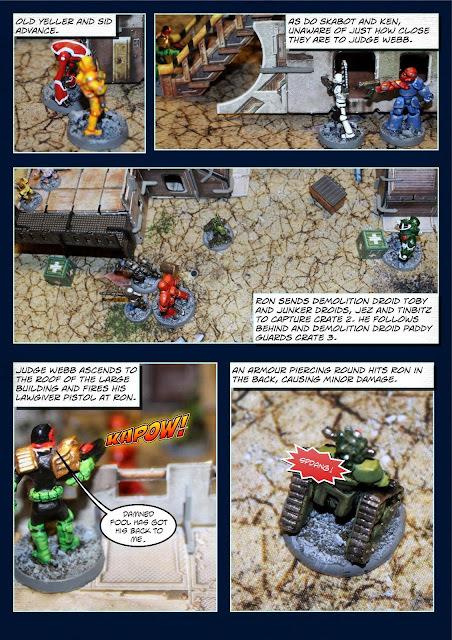 Junker droid Jez was produced Warlord Games and he is a Level:0 Robot Infantry Minion armed with a Zip Gun Pistol. He costs just 40 Credits. His colleague is called Tinbitz (named after the OOP Citadel paint he was partially painted in). He is a very old and rare Citadel Miniatures figure based on the Tin Man from The Wizard of Oz. He is also a Level:0 Robot Infantry Minion and he is armed with a Large Club (his left arm). He costs 35 credits. All Junker droids have the following Special Rule - Junker. The Junker has constantly failing systems and a D10 must be rolled at the start of every battle. On a roll of 1 or 2, the Junker has suffered a serious failure and will be forced to miss the fight. However, so many replacements have been made that parts can get shot off the Junker all day and it will have little effect on its functionality. Whenever the Junker is to be removed as a casualty, roll a D10. On a roll of 7 or more, it remains in the fight with one Hit left. Second from the right is a Robodoc. Robodocs are never used in a Renegade Robot force. They are typically employed by humans. A staple of hospitals in Mega City One, a Robodoc can be worth its weight in Umpty Candy to a gang who finds it has injured members but cannot go to official medical facilities. This multi-part model (its six arms were separate components) was produced by Warlord Games. A Robodoc is a Level:0 Robot Infantry Minion equipped with a Medi-Kit. A Robodoc has two Special Rules. First is Buy, not Lease. Many gang leaders become suitably impressed with a Robodoc they have hired and make moves to purchase it, whether through legal channels or not. After a Robodoc has been used as a mercenary, you may choose to buy it permanently for 100 Credits. It normally cost 50 Credits to hire. Secondly, it has Mechanised Healer. If a Robodoc is present during a battle, it can get to injured allies in the aftermath, quickly enough to perform emergency procedures. If the Robodoc is not a casualty at the end of a battle, pick one casualty and roll a D10. On a 3 or more, the model need not roll on the Injury Table and will return to the force unharmed. The Robodoc may administer to other injured members after this, but there will be a cumulative -2 penalty on the die roll for every further attempt. At the far right is a Robodog, who may be used in a Renegade Robot force or by any Mega City One citizen. While not the brightest of robots, robodogs are nevertheless treated with some affection by their comrades and tend to be intensely loyal to the force. This robodog was produced by Warlord Games. He is a Level:0 Robot Infantry Minion and has the Upgraded Armour option, making him worth 50 Credits. A robodog's bite is Damage 1 and AP -2. I named this robodog, Butch. All robodogs have the Special Rule - Sniff Sensors. Robodogs gain a +2 bonus to Will checks made against enemies using the Sneaky Does It Talents. I have ordered from Johnny before and can assure you he is very reliable and he always sends his products out on time. The Kickstarter is fully funded and still has a couple of weeks left to run. One of my favourite web-stores is Wargames Terrain Workshop, run by Dave Stone, who has become a very good friend of mine. Dave has been picking my brain for ideas for scenery and figures to use in the Judge Dredd Miniatures Game but to keep them generic enough so as to avoid copyright problems. Dave is a huge 2000AD fan so it has been a lot of fun swapping ideas. I therefore make no apologies for the bias of my review here. However, WTW are not a widely known company so the main purpose of this review is to spread the word about them to a wider audience and hopefully drum up more business for Dave. One of the first scenery items I asked Dave to make were Justice Department holding posts. These are used to handcuff perps to the post, where they are held in place until they can be transported to a Sector House or Iso-cube facility. The actual Justice Department holding posts have an eagle sculpture on top of them but I understand why Dave omitted it as it would have made them too distinctive as belonging to Judge Dredd. Nevertheless these are perfectly acceptable substitutes. To give you an idea of how tall they are I have included a Wargames Foundry figure of Judge Dredd in my photos (this is actually the figure I use for my own Judge Scott in my JDMG campaign). A set of two holding posts includes one with two arms and one with four arms and they cost £1.00 unpainted or £1.80 painted. I bought two sets of the unpainted versions. My colour scheme is slightly different to Dave's. I gave mine gold tops not silver as Dave had done. They are listed as Prisoner Posts in the Future Scenics section of the WTW webstore. However, they would work equally well as posts for securing bicycles in a contemporary setting. Next on my list of items I wanted sculpting were garbage disposal units. These are essentially litter bins that grind any rubbish put in them into tiny pieces to make it easier to dispose of. They have also been used to illegally dispose of bodies or body parts! These also come in two versions. As soon as I saw them I was struck by how much they look like garbage droid Ro-Jaws from the Robusters and ABC Warriors series from 2000AD comic. I just had to include this Wargames Foundry figure of Ro-Jaws in one of my photos. My colour scheme for the garbage disposal units is almost identical to that of Dave's but I extended the yellow border all the way around the mouth section to provide a better contrast for the word, WASTE. As you can see with this photo directly above with the Judge, they are quite tall and chunky. Once again, they are very reasonably priced. A set of one of each of the two types costs £1.50 unpainted or £2.70 painted. Yet again, I bought two sets of the unpainted versions. One item in particular that I was very keen to see was a futuristic car. Dave has really surpassed himself with this absolutely amazing sculpt. When I saw them on the WTW webstore I wrongly assumed they were quite small. It was only when I received them through the post and was able to see them in the flesh that I realised these are really big sculpts. This is why I have included the Judge figure in my photos to show how big they are. The really clever thing that Dave has done with them is to allow you to use them as a ground car or a hover car. You can see the subtle differences between them in the two photos above. The blue car is the ground car and the red car is the hover car. Dave has named these as a Lamborarri 2000 Sports Car. I like the name! For such a big chunk of resin, these are incredibly cheap, costing just £5.00 for an unpainted model. However, when I saw how incredibly well Dave had painted his, I knew that A) I would struggle to replicate his colour scheme, and B) it would be a time consuming paint job. 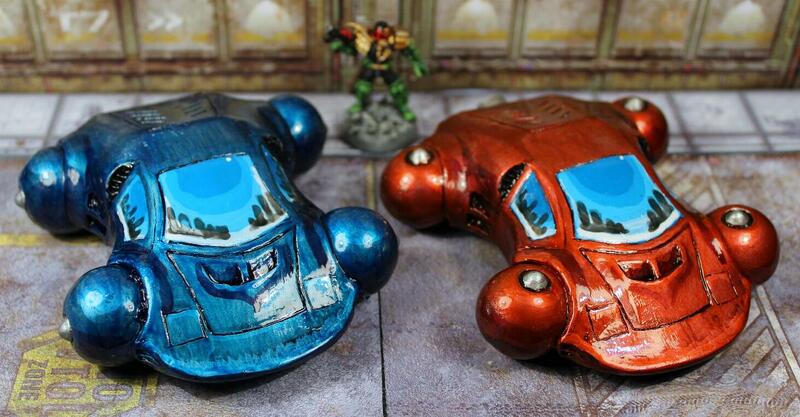 So I ordered the painted versions of the two cars. They cost £9.00 each, which to me, was an absolute bargain. Dave was incredibly helpful, and he asked me what colours I wanted them painting in and even asked what I'd like on their registration plates. Having fallen in love with Dave's red car I asked for one just like it and for the other, a blue version. The number plates do have meaning. WTW 1 stands for Wargames Terrain Workshop 1 (an obvious choice, I felt) and BS 24 is my initials (Bryan Scott) and the day of my birth. There are many crazes in Mega City One. One of the more popular crazes is Boinging. Boing is a spray-on rubber coating that solidifies into a giant ball around the user, turning them into a human pinball. Safely encased within the Boing ball, the occupant can still breathe naturally but is impervious to outside forces, allowing them to bounce great distances. Due to the great destruction that can be caused by citizens hurtling themselves off city blocks and then bouncing for miles, Boing may only be used in special Palais-de-Boing leisure domes. 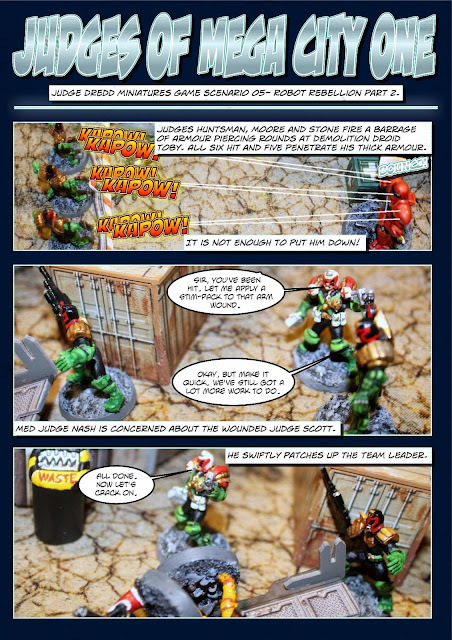 I have had a hankering for adding Boing users to to my Judge Dredd Miniatures Game for quite some time but seeing as no one sells them I had to come up with a way to make them myself. I think I succeeded admirably. I picked out four spare Heroclix figures I had whom I thought were in suitable poses (I was looking for figures who had one or two hands outstretched) and removed them from their bases. All four figures were repainted as MC1 citizens. The idea for the Boing ball came quite by accident when I was browsing on Amazon UK. 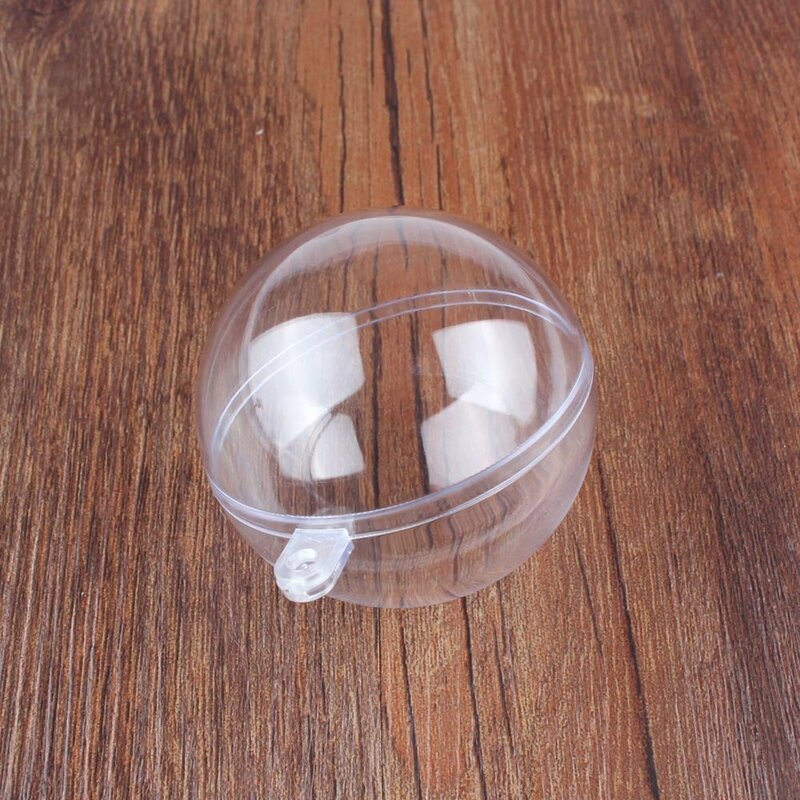 I came across a product to be used as a Christmas tree decoration made of clear plastic. It came in half and could be filled with sweets or a very small presents. They looked perfect for my needs. 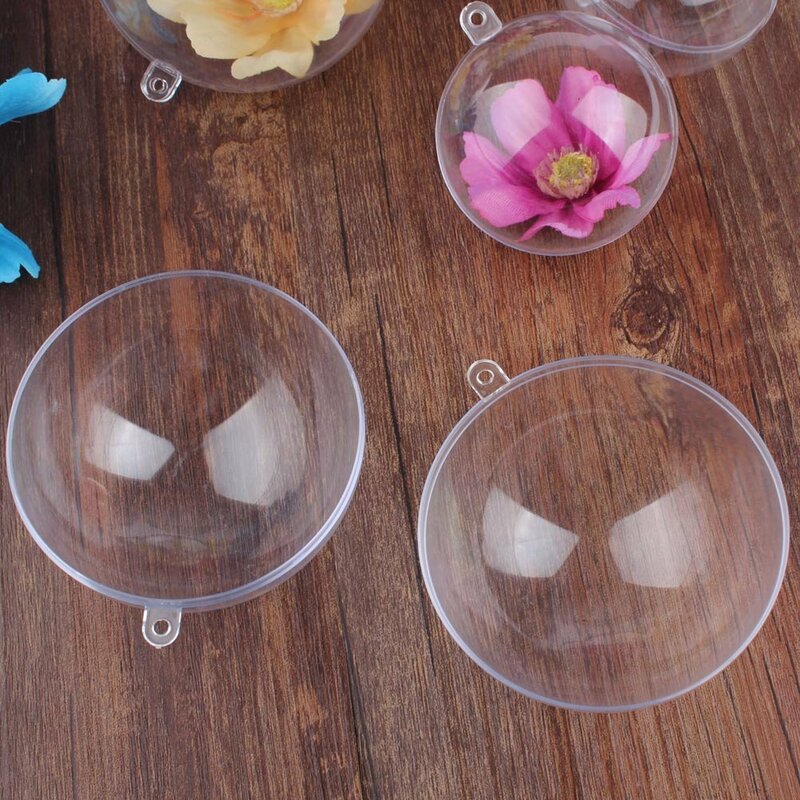 These clear plastic baubles come in various sizes ranging from 30mm in diameter to 180mm in diameter. I chose the 40mm diameter balls, which worked perfectly for me. I used superglue to glue the figures into one half of the baubles. The two halves were snapped shut and because they are such a tight fit, I did not glue them together. The tabs for attaching the baubles to something to hang on the Christmas tree were clipped off, leaving my Boing balls perfectly round. It was a simple but very successful conversion, that I am very pleased with. Note that I had to use small blobs of Blu-tac to fix my Boingers in place when I took my photos of them. They will roll all over the place if you just breathe on them! 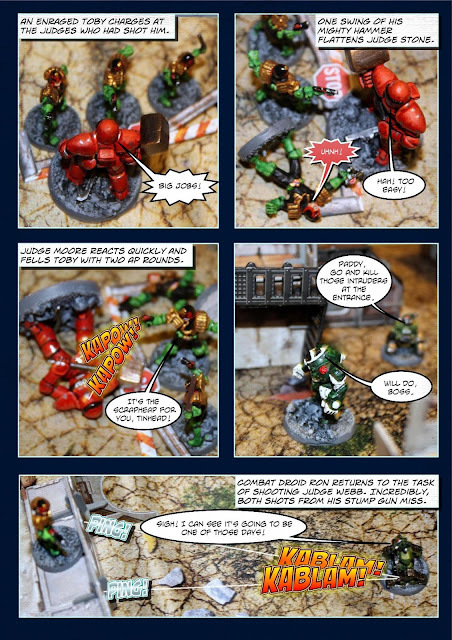 Although there are no rules for using Boingers in the JDMG main rulebook, they do appear as one of the Random Events results (Boing Attack!) in the Blood on the Streets supplement (see page 131). There it states, "A Boing user bounces straight into the battle and then, just as quick, bounces back out again. Both players select one their own models and roll a die. If either rolls a 1, their model has been struck by the Boing user (if both roll a 1, both models have been hit - the Boing user has brought a friend). If neither rolls a 1, both players select another model in each of their forces and rolls again. This continues until at least one 1 has been rolled, or all models have been rolled against. If a model is hit by a Boing attack, it must pass an Agility test (a roll of 6+ on 1D10). If it fails, roll one die and lose that many Hits. Armour does not protect against Boing!" This led me to thinking, what if you could use a Boinger as a mercenary to be hired by your force? So, I came up with these stats for a Boing user. Type: Infantry Minion. Move 2D10", Agility +1, Shoot +0, Melee +0, Melee Dice 2D, Will +0, Armour Special, Hits 1. Cost 60 Credits (includes 40 Credits for the cost of the Boing suit). To move, a Boing user must pass an Agility check to determine the direction of the bounce. A failure results in him bouncing in a random direction. I suggest rolling 1D12 to determine the direction, with 12 being the direction you wanted to travel in but you can use whatever method works best for you. Distance moved is determined by rolling two dice and adding their results together. If this causes the model to exit a table edge, they are removed from the game. For a Boing user to attack another model, make a Melee strike as normal. If the Boing user succeeds, the target takes 1d5 Hits of damage with no Armour save allowed. This is deliberately less than that of the Boing Attack random event because they are not bouncing from such a great height. Boing is impervious to any attack except Laser weapons or those that cause Fire. For these attacks Boing has AP+0. A Boing user may not use any weapons whilst encased in Boing. The following may hire a Boing user as a mercenary - Ape Gang, Futsie, Mobsters or Street Gang. Please do be aware, these come from China and I had to wait four weeks for mine to arrive. They were well packaged and arrived safely. You can buy them in packs of 10, 20, 50 or 100. Prices are very reasonable - £3.69 for ten 40mm diameter baubles with free post and packing to the UK.